This wonderful region in the northeast of the country on the Adriatic Sea, offers diverse landscapes from high mountains, a striking plateau, and beautiful coastline. Here you will find the eastern Dolomites and the Alps. Its strategic location bordering Slovenia and Austria has contributed to its complex history. Friuli-Venezia Giulia is an area where many civilizations that have come together. As such the region offers many cultural and traditional experiences. Its cuisine is influenced by the Slavic, central European and Venetian cultures. Polenta made with corn meal is served in many ways but the typical way is with pork meat, sausages. The speciality of the region is the prosciutto of San Daniele which is world famous. The region offers some wonderful wines but is most famous for its grappas which are very strong digestives. In Trieste its elegant capital city, one can see the influence of the Austro-Hungarian and Slavic cultures. 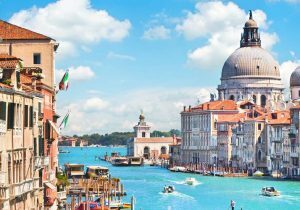 The city is a mix of medieval and neoclassical styles with its grand old cafes, beautiful buildings along its Grand Canal and its many monuments. For Roman history one should not miss visiting Aquileia which was one of the most important towns of the Empire. In Aquileia you will also find outstanding works of early Christian art.